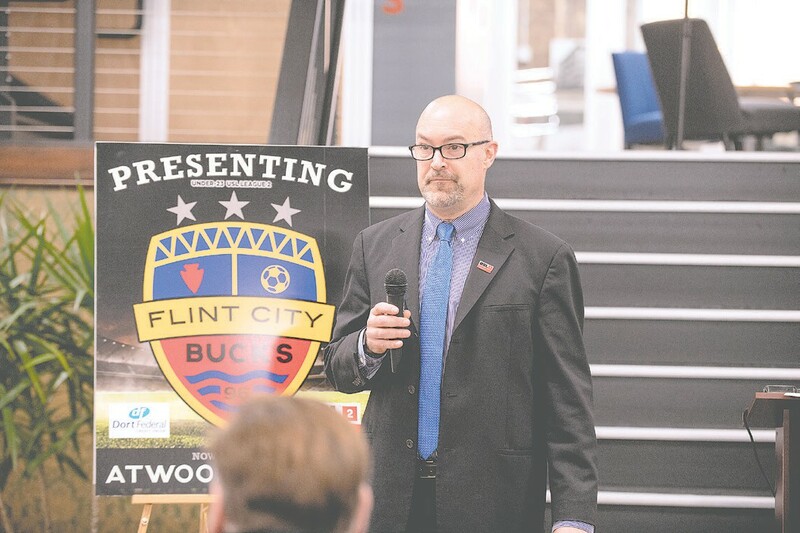 FLINT — The Flint City Bucks of the USL League Two will take to the field at legendary Atwood Stadium for the 2019 season sporting a revamped name, team colors and crest that was unveiled in a press conference at the Ferris Wheel last Wednesday. All aspects of the former Michigan Bucks soccer team branding – the result of a popular online contest – have links to the roots of the game and the proud history of the city it now calls home, including the citizens and fans who ultimately decided on its name. More than 1,000 online entries were received in the franchise’s “Name the Team” contest. A list of the team’s top choices was then presented to Mindy Prusa, Director of Flint’s Whaley Children’s Center. Working with about 40 of the residents at the Center, Prusa worked with the excited children to decide on the winning entry. That winning combination came from the collaboration of the Whaley Children along with Flint resident and local freelance photographer, Kayce McClure, who tagged the new moniker. The response to the contest showed the support the team has from the Flint community. 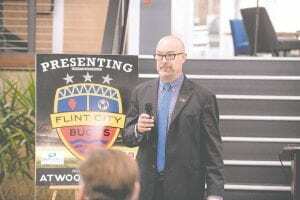 The new name – Flint City Bucks – pulls from European convention using the name of the town followed by the word City. Considering the impact Flint has had on Michigan and U.S. history, it is prominent in the team’s name. The colors of the team – blue, red and gold – also pay homage to three distinct contributors to the team and its city. Blue signifies the decades-long dominance of “blue collar” workers who are the backbone of Flint, its work ethic and economy. Blue also signifies the renaissance of the 142-mile Flint River, which was recently named one of the first State of Michigan Water Trails. The renovation and rebirth of Flint River’s pathway through the city – adding safe recreational activities and events – illustrates the exciting and changing vitality of Flint. Red harkens to historic red brick-lined Saginaw Street, which winds through historic downtown Flint. The brick-lined streets have witnessed Billy Durant’s first meeting to invent General Motors at the Dresden Hotel as well as meetings held by David Buick, Walter Chrysler, Alfred Sloan and Albert Champion. They also served as a personal test track for Louis Chevrolet. Gold nods to Kettering University, which took ownership and renovated historic Atwood Stadium where the Flint City Bucks will play all of their home matches. The team’s new logo intertwines all of these aspects, including the arrowhead that has long symbolized other prominent Flint businesses, athletic teams, service organizations and even the Flint Police Department. The arrowhead can be documented as far back as the 1800s when the Chippewa Indians resided in the area. Woodward Movement Creative, a design, printing and branding agency, teamed up with local freelance designer, Jesse Augustine of Grand Blanc, MI to create the new revamped logo. Contest co-winner, Kayce McClure will receive four VIP inaugural season tickets, two VIP parking passes and a team autographed jersey. The Whaley’s Children will have an open invitation to any game, anytime compliments of the team and its generous community sponsors.